It is “the how” not “the what” that matters. 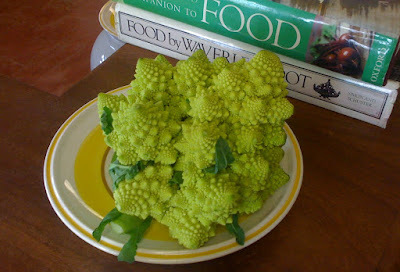 Meet romanesco. It has been around since at least the 16th century. A little more tender than brocolli, with a fresh, green, cauliflower-like flavor, it is better tossed in olive oil, garlic & salt and then roasted instead of being boiled. We like it for its logarithmic or fractal spirals. Nature should be pretty proud of this one. Toward the end of the semester we get familiar enough with one another that it is hard not to spend social time and we find ourselves getting less and less done. The challenge of getting past “the what” in the activity and getting into “the how” becomes pretty apparent. Especially when it comes to cleaning, we find clusters of people in corners of the room talking or texting and perspective disappears. 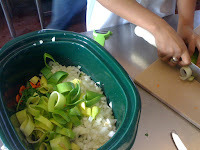 chopping onions and leek tops for vegetable stock. It is easy when looking for a job to center around what one can do. But what ends up mattering more to an employer is how you will work, much more than what you can do. Today we started class talking about pride of work, being proud of how you work as a way to gaining the kind of experience and work ethic that is useful in any job. When it comes to the less glamorous tasks such as cleaning, once one student starts jumping in, the rest soon realize it is not a big deal and cleaning as a group goes pretty quickly. Luckily, with cooking in class we have the bonus that they can see and taste the results of their labor — a quicker connection to that kind of pride in how we work, a tangible chance to get to a sense of accomplishment. Pride of work comes before much of what we think needs to happen to get a job and the only way to get it is to do something, anything and to do it the best you can.